It was a bit strange leaving Fort Kent because I was no longer on the Northern Forest Canoe Trail with a clear map and exact descriptions for what to expect. From here it was all new. The St. John picks up more water from tributary streams and you can feel the volume of flow pick up under your hole. Waves get longer and there are many boils but the rapids are largely class one and two. From Fort Kent to Madawaska there were intermittent class one and two rapids keeping things interesting. However, from Madawaska onward, not a ripple was to be found, and it’s essentially lake paddling on a lake that is moving at 3 or 4 mph. I had put in a little bit better than 30 miles and was looking to tack on some more until I was run down by an apocalyptic thunderstorm. I was forced to get off of the water as soon as possible and found some fiddlehead pickers with their boat at a boat ramp in Grand Isle, Maine. The storm was moving in and it was getting dark, so I asked them if there was a campground or a motel nearby. They laughed and said there was no motel for miles and the nearest campground was a half-mile up Route 1. I cannot begin to express how grateful I was. Literally within 10 minutes I was at their kitchen table with Armageddon occurring outside where I would have been was it not for her incredible generosity. The next morning I got up early and was on the water by 8am and at this point the St. John is wider and a bit slower and subject to wind. However, I was very fortunate to have a light tailwind. I went to Van Buren, Maine and the U.S. Customs to ask about the right way to approach Canadian Customs because I did not see a boat ramp or a way for me to get up to the Customs Station. They called The Canadian Customs for me to let them know that I was canoeing over to be processed. 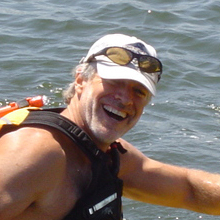 They showed me out the door and I went back to my canoe and paddle to Canada, which was about 400 yards. I beached my boat and climbed an incredibly steep embankment, hopped the guard rail and went into the the Customs Station. I spent about a half an hour there being processed and it was uneventful. I learned that you can bring bear spray into the country, but not mace. I had thought even bear spray was prohibited so had been packing my kayaking air horn to hopefully startle a bear and hasten its retreat. Fingers crossed on that strategy! I returned to my boat and paddled all the way to Grand Falls, New Brunswick, which is a distance of about 27 miles in all. I came across a man readying his pontoon boat for tourist season. I asked about the location of the marina above the dam and falls at Grand Falls and also asked how far away from the marina my hotel was. Gaetan, a retiree with his second career providing scenic cruises for visitors was a jovial and accommodating French-Canadian. He gave me his card and cell number and said, “If you and your boat need a ride to the hotel or if you need help at anytime while in Canada, give me a call and I will help you.” Another example of the truly wonderful people I am meeting on this amazing journey. Once I got to the marina, I had no good way of getting to the motel where I would be meeting Nicole later. I went to the marina building that was also a bar and restaurant and I ordered a Moosehead Pale Ale – the best thing that they had available. A bit skunky for my taste, but it went down very well. I chatted with a used car dealer who had stopped by for a drink to make his afternoon go a bit more smoothly. He volunteered to give me a ride to the hotel so I could see how far it would be to schlep my canoe and gear. He bought my beer and off we went. With only two miles, I decided to hoof it. I checked in, which is always a spectacle for onlookers. A little rough around the edges guy in dry pants, ball cap and big backpack who came with the canoe outside the door. It has proved to be a good conversation starter! I proceeded to lock myself out of my room, so went to the office for another key. 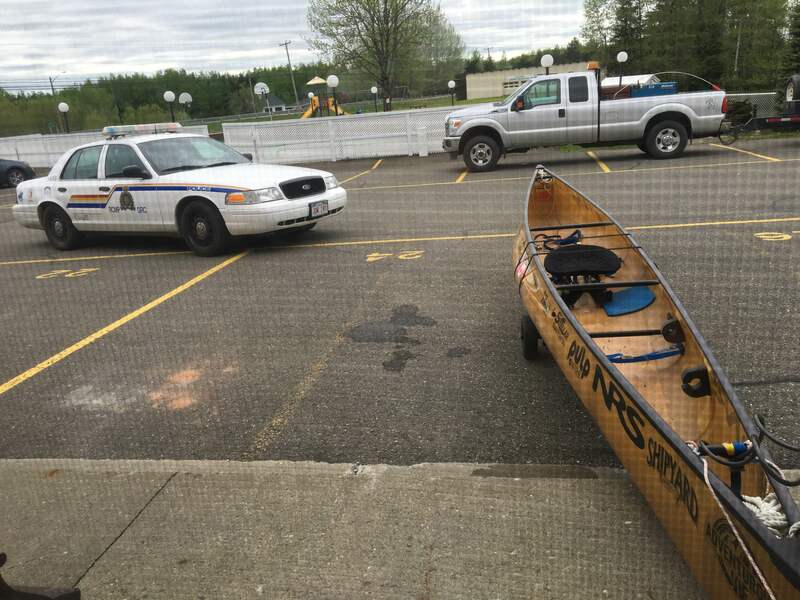 As I approached the room from outside, a Royal Canadian Mounted Police cruiser, lights on, came to a screeching stop next to my canoe. The officer jumped out and with hand on gun addressed the two guys from the room next to mine who were sipping their beers. “French or English?” They said, “English.” “Is that your canoe?” “Nope, it’s his,” they said pointing to me. The officer spun around. “French or English? !” he demanded. I’ll cut to the chase. An all points bulletin was out for all of law enforcement. It had been reported that someone may have tried to jump the border by canoe. He had seen my canoe from the main road, in the parking spot for my room, bike locked to a pillar. He had found the fugitive! I gave him my passport and he confined me to my room, advising me not to try leaving and that he could cuff me and put me in the cruiser if he wanted. I told him I’d do whatever he wants me to do and that I’m not planning on going anywhere. I changed out of my paddling clothes while he did his police thing in the cruiser. He came back to the room and told me that border patrol had no record of my entering the country. I told him all the details of my processing visit with Canadian Customs in hope that someone might remember processing a 60-year-old American canoeist from Maine. He told me not to leave and he would make some other calls. He returned after ten minutes and said I was all set. I am John M. Connelly III and apparently the searches for my border entry neglected the III so I wasn’t showing up. I was a little disappointed that I didn’t get a ride to the station in handcuffs. It would have added so much richness to my story of this journey! Hello John, my brother Barry and I met you and your wife at the Bistro in Perth Andover, N.B. John, I loved your beer critique! Ran into Nicole, who kindly brought me up to date. Sorry about the handcuff disappointment. People are loving the coffee porter! John: It was really great meeting you in Lubec then finding out that we had so much in common. During my peak racing years you were a pre-teen so even if you were at the same races we likely would not have met. I was 22 when I hung up my skirt but still regret leaving that world behind. I’m looking forward to hearing of your successful return home, and hope you’ll come back to Lubec so I can dig up some more of those photos from the sixties and early seventies! Yes, John. Great meeting you and having an opportunity to chat. Paddling and beer. Good common ground!